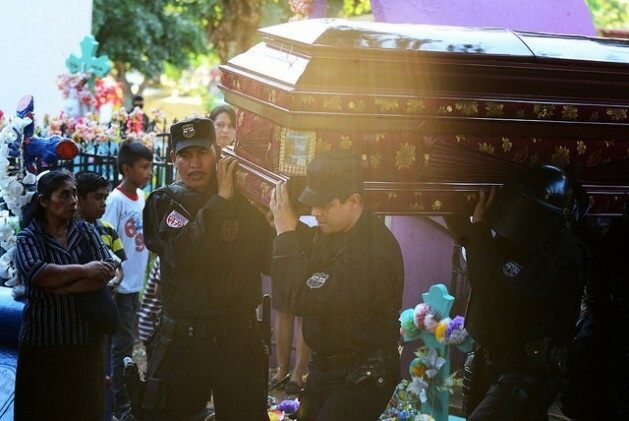 SAN SALVADOR, Apr 23 2015 (IPS) - The resurgence of violent crime in El Salvador is giving rise to a hostile social environment in El Salvador reminiscent of the country’s 12-year civil war, which could compromise the country’s still unsteady democracy. After recent attacks by gangs against police and soldiers, there is talk in the legislature of declaring a state of siege in the most violent urban areas, and the government ordered the creation of three quick response battalions, similar to the ones that operated during the 1980-1992 civil war. These military units were responsible for a number of massacres of civilians, such as the 1981 mass killing in the village of El Mozote in the northern department of Morazán, where more than 1,000 rural villagers were killed by members of the Atlacatl battalion. Meanwhile, police and local residents are openly discussing the creation of groups to exterminate gangs, along the lines of far-right paramilitary death squads active in the country from the 1970s until the end of the armed conflict in 1992. “It is extremely dangerous to be talking about a state of siege and all that, because it could affect the country’s democratic process,” the coordinator of the ecumenical Pastoral Initiative for Peace and Life (IPAZ), Félix Arévalo, told IPS. IPAZ brings together leaders from different religious faiths seeking a negotiated solution to the problem of gang violence plaguing this impoverished Central American nation of 6.3 million. If approved by parliament, the state of siege would suspend constitutional guarantees such as freedom of assembly and free passage, while militarising areas with high murder rates. The last time a state of siege was declared in El Salvador was during the November 1989 guerrilla offensive known as “To the limit”, in the midst of the armed conflict that left 75,000 people dead and 8,000 “disappeared”. The country is now governed by one of the former guerrilla leaders, Salvador Sánchez Cerén of the left-wing Farabundo Martí National Liberation Front (FMLN), which became a political party after the 1992 peace accords and has been in power since 2009. His government says the new wave of violence is part of a backlash by the gangs against the Feb. 14 transfer of their leaders from a medium to a maximum security prison known as Zacatraz, located in the city of Zacatecoluca, 41 km east of San Salvador. The transferred prisoners included several of the heads of the MS13 and Barrio 18, the two gangs that reached a truce in March 2012 which led to a sharp drop in the number of murders. Raúl Mijango, who helped broker the truce, told IPS that as a result of the decision to isolate the leaders, younger, more fanatic members who have made violence a way of life now lead the gangs’ activities. “The last thing these young men are thinking about is stopping this conflict,” he said. The truce collapsed in May 2013, when then President Mauricio Funes (2009-2014) of the FMLN was forced to remove the minister of justice and security, General David Munguía, one of the main drivers of the talks from within the government, over a technicality. As of Monday Apr. 20, the gangs had killed – besides civilians – 20 police officers, six members of the military, one prosecutor and six prison guards in an undeclared war also fuelled by the police and military response that has left dozens of gang members dead in clashes. On Apr. 18, nine gang members were shot by a military squadron in Uluapa Arriba, in the city of Zacatecoluca. Some police have even openly talked about killing gang members. “When they (the gang members) run into us, we’re going to kill them,” one police officer wearing a face mask told a local TV station. And circulating on the social networks are amateur videos of police and locals urging people to kill the “mareros” – members of the gangs or “maras” as they are known in Central America – the same way death squads killed left-wing opponents during the war. In March, the number of homicides shot up. That month was the most violent so far in the last decade, according to police figures: 481 homicides, an average of 16 murders a day, 56.2 percent more than in March 2014. If that tendency holds steady, by the end of this year more than 5,000 murders will have been committed, for a homicide rate of 86 per 100,000 population, far above the already high 2014 rate of 63 per 100,000. El Salvador is one of the world’s most violent countries, according to the United Nations Office on Drugs and Crime (UNODC). The average Latin American murder rate is 29 per 100,000 inhabitants and the global average is 6.2. The driving force behind the call for a state of siege are lawmakers from the right-wing Great Alliance for National Union, which holds 11 of the 84 seats in the single-chamber legislature whose term begins May 1, after the March elections. “This escalation of violence could have been avoided,” said Arévalo, “if an attempt had been made to hold talks including the gangs” – an idea that is staunchly opposed by most political factions, due to society’s outrage against the gangs, which have an estimated combined total of 60,00 members. In January the government of Sánchez Cerén cut off any possibility of dialogue with the gangs. Roberto Valent, resident representative of the United Nations Development Programme (UNDP), told IPS that the scaling up of gang activity was in part a response to the state’s attempt, through a stepped-up police presence, to reassert control over territory in the hands of gangs. Police action is important, he said, to pave the way for prevention, rehabilitation and socioeconomic reinsertion in those areas. “It’s clearly a reaction to what the state is doing,” said Valent, who was technical coordinator of the National Council for Citizen Security and Coexistence. The Council, set up by the president in September 2014, was tasked with setting forth proposals for fighting crime, with the participation of different segments of society and technical support from international donors. In January, the Council proposed 124 measures that the government plans to adopt to fight the wave of crime and violence. Part of the two billion dollars needed to implement a five-year plan have been obtained. The programme will include educational, healthcare and recreational initiatives, while creating 250,000 jobs for at-risk youngsters. But in practice, the government has demonstrated more interest in stiffening its policy of cracking down on crime by stepping up police and military action. The president has announced a restructuring and strengthening of the police, as well as the creation of more elite units to combat the gangs. “We have stirred up a hornet’s nest; the government acted mistakenly, you can’t implement a plan with corpses falling every which way,” he argued. After 40 years El salvador is ready for more death squads? They still haven’t recovered from the last go-round. Why not try a working justice system? Start with ‘death squads’. Cuscatlán Battalion or secret special OPs needs to go into effect, it’s sad but the good people are suffering and time will just make the gang CANCER stronger with no cure only death of a wonderful country and culture. DO RESEARCH on ORTEGA and NICARAGUA and how they handled the gang issue not many made it to court from the fighting thats an urban internal war and resulted less overpopulated prisons during the battle they was given a chance to surrender if not it was all out battle. Now Nicaragua has growth jobs, international investment is moving in, more rural poor are getting help electricity, job training, better life. A Large number of international aid groups are just moving next door to Nicaragua and helping people there. SO who is left to help El Salvador’s good people, every international group to help are scared and leaving so who’s left to help? Your Gov’t come on all pockets are being filled with money with none left to help the people and your President could care less he just sleeps at major international events with other heads of state in the region trying to help he can’t remember anything what was said WHY he was sleeping, check it out it’s well documented, HE is no ORTEGA at a time I thought pres. Ortega was nuts be he really has turned a 180 and has worked for his people.